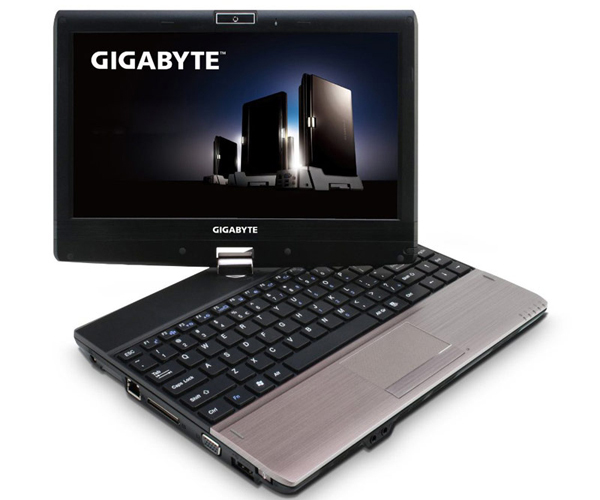 The Gigabyte T1125N is part of a rather exclusive class of products, namely netvertibles, referring to products that can be both tablets and netbooks. This way, it’s twice as hard to say if this is a good machine, as it should satisfy the need of both tableteers and those after a more classic netbook experience. For what it’s worth, Gigabyte gave it their best shot in order to come up with a truly unique and top notch solution when it comes to performance. We’ll have a go at this netvertible in the review to come, so stick around and find out what we think about it below. Let’s warm up with a little rundown of the specs on this one. The specs are pretty impressive, no matter if we take this as a netbook or especially as a tablet. Plus, there’s the docking station and the included DVD burner, which makes this a little palace of its own, with all the options and extra components it offers. At a first glance, the T1125N looks very solid. The lid is made from brushed aluminium, and the base of the device is made from the same material. Exception makes the palm rest area, which is made out of plastic, but a really sturdy one, which resembles aluminium. Overall, it’s a big boy, and looks and feels like it can do well all on its own, without added protection from a case or something. But maybe the most important part of the design of the T1125N is the hinge that allows you to rotate the screen and fold it down over the keyboard to go into tablet mode. The hinge is covered in silver plastic and feels kind of solid when rotating it. The connection with the screen is much more sturdy than the one with the base, which is a little loose and might give up sooner rather than later. The keyboard is pretty standard chiclet, while the touchpad is big for a device with these dimensions and supports multi touch. The space between the keys on the keyboard is pretty significant, so typos won’t be a problem after a short while of getting used to it. The keys don’t have a perfect fit and are a little wiggly when pressed– and if you’re a fast typist, expect some finger slipping. The single mouse button tends to be a little noisy when used, but overall the touch pad experience is pretty good, considering the large size and the support for two finger multi touch. 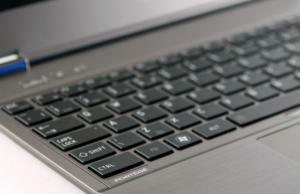 The screen of the T1125N has a 1366 x 768 resolution and has support for multi touch. The screen comes with an anti glare treatment and I don’t know if it’s because of this, but the colors are kind of damp. 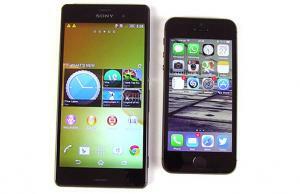 The screen is not “vibrant”, as we like to say, but it still delivers an HD experience. Also, the anti glare functions and not really, as using it outdoors is rather impossible. Also, when in battery mode, the screen is even more difficult to look at. Viewing angles are not very good also, as looking at the screen other than straight forward will lead to colour distortion. The touch experience is much more satisfying, as the screen is very responsive to touch input and supports multi touch. 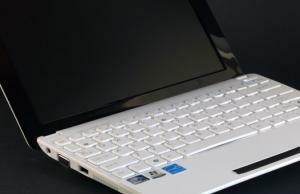 The T1125N is powered by a Core i5 low voltage CPU, with a clock rate of 1.33 GHZ. You can increase that to 1.86 GHZ with Turbo Boost, which will bring some superior performance and multitasking for a short time. There’s also 4 GB of RAM and a rather slow 500 GB, 5400 rpm hard disk drive. The processor comes with integrated Intel HD graphics, but you don’t have to rely only on that, as there’s also an Nvidia Gforce 330M video card with dedicated 512 MB of memory. The video card can be disabled when you don’t need it, so you can save some battery life. We didn’t had any problems running multiple programs at once on this one and the Windows 7 experience was overall smooth. You can play HD content even using the onboard video card, but for smooth HD playback, you should switch to the Gforce video card. Gaming is not really an option, as synthetic tests positioned the video card bellow the acceptable mark for decent gaming, but if you play older games or don’t mind low detail levels on newer ones, you might be well covered. The T1125N has lots of ports, both on the body and on the docking station. There are the standard USB 2.0 and card reader slots, as well as 3 (in total) USB 3.0 ports- one on the body and two on the docking station. There’s naturally a HDMI port, as well as VGA. You can go online thanks to a WiFi module, but there’s also an option to go for 3.5G. For such a cute and small netvertible, the T1125N is rather noisy, even under normal use circumstances. When you use it for simple tasks, such as browsing or writing, the fan kicks in from time to time and, trust me, you can hear it. It’s worse when you stretch the processor and video card, as the noise will be significantly higher, making things a little unpleasant at times. Because of the metal body, the T1125N doesn’t get too hot, reaching a maximum of 32 degrees Celsius on the palm rest and 47 on the bottom. As with most speakers on netbooks, the ones on the T1125N can’t deliver good bass and treble. Still, the sound is well balanced most of the time and loud enough to fill a small to medium room. The T1125N comes with Windows 7 and a control panel named Smart Manager, that lets you change screen orientation, power options, brightness and stuff. The touch experience is like you would expect from a Windows 7 device, meaning not very good, but considering there’s a keyboard there, maybe you should use the touch input only when completely necessary or if there’s a 100% optimized app going. As usual, you should get rid of the bloatware. This is a problem with the T1125N. Under normal use circumstances, the netvertible was able to deliver only 3 and a half hours of battery life. This means surfing the web, working with documents and other basic stuff. If you play a movie, the battery will be depleted after only 2 and a half hours. With a better battery life, this could have been a marvelous device. 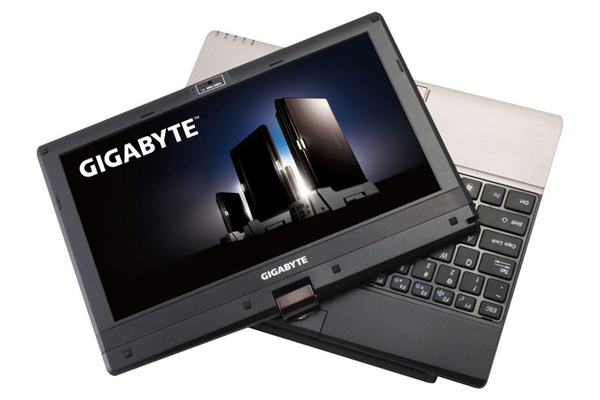 But considering it’s more of a desktop replacement solution, battery life was not probably on Gigabyte’s agenda when designing this. The T1125N has a starting price of $1099, which will get you the 2 GB of RAM/ 320 GB HDD and there’s also a more expensive version, selling for $1249, which comes with 4 GB of RAM and 500 GB of storage. 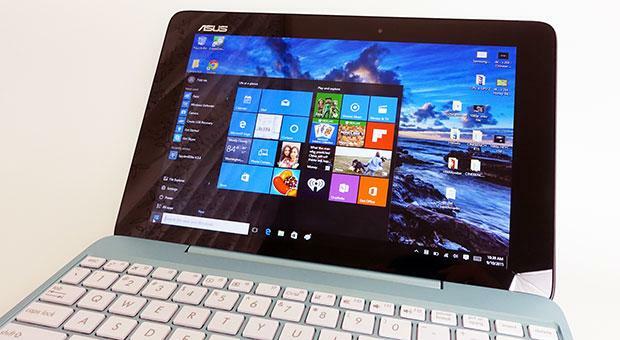 The T1125N is a very interesting device, as it offers both a desktop and tablet experience. 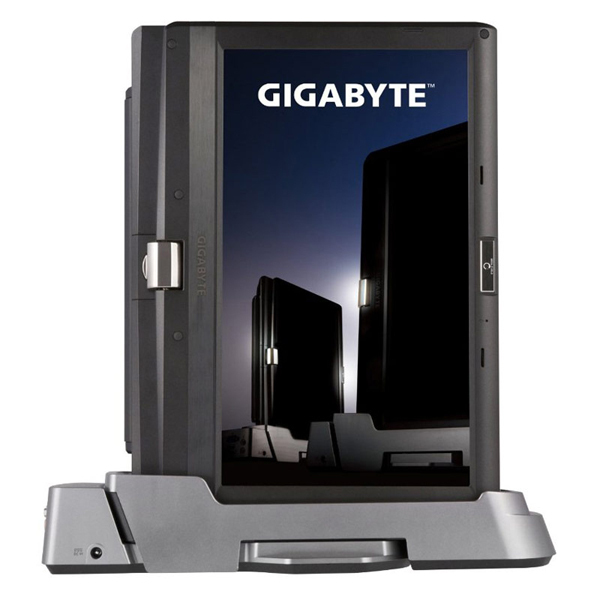 More, it comes with a docking station and a DVD drive, covering basically many of the needs of the modern user. The hardware is not bad either, even if instead of the Core i5 it would have been nice to see something like i7. Performance is largely good, although the battery life is kind of worrying if you want some autonomy, but if you’ll use it mainly at home, it shouldn’t be a problem.